Finally, I get to review an IPad App! I just purchased my very own IPad mini, reluctantly; I have always been a PC user. 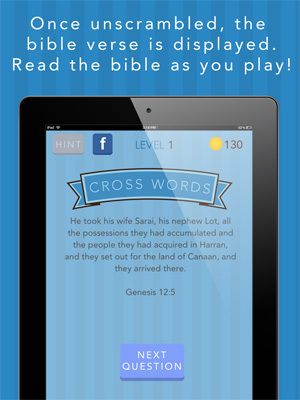 But the timing could not have been better, as soon after I was asked to review a Christian App called Cross Words: A Bible Trivia Word Game. Now I’m hooked! 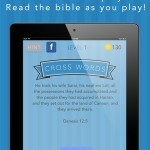 Cross Words, just having gone live yesterday, 6/21/13, is an educational IPad App that uses crossword puzzles an d biblical quotes, and was a perfect way for me to get accustomed to my IPad. Not only did I get to polish my memory on biblical “persons, places and things,” but I had fun doing it, as this integrates easy to use drag and drop functionality along with integration to the App store and even Facebook. From a technological standpoint, which I always begin my reviews with (I’ll never let go of my past IT endeavors), this all worked without a hitch. Easy to install, easy to learn and easy to use. The sounds are rich too: “cha-ching” with a letter right, a scratchy record sound if wrong (made me laugh), and a sound that makes you feel real special when you finish the puzzle. Now on to the fun! 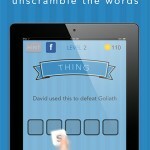 This app was super creative, not only from a user point of view, but also a developer’s point of view. Using a point system based on coins and levels, the questions get progressively harder as time goes on. But don’t get too confident; be weary! Five coins are handed to you for a correct letter, but 20 coins are removed if you get one wrong! Want a hint? Sure, no problem. But make sure you’ve banked up: the help costs 60 coins. This system made a simple concept of crossword puzzles fun, challenging, and I didn’t get bored. It was addictive in its own way, but I didn’t feel guilty about it – after all, I was studying the bible! In no time I got to show off my skills and collected 1,000 points. If my wife had been with me, we could have also played this trivia challenge together. It starts off as a free app. There are a few in-app purchase suggestion pop-ups for this free version, but as you rake up more and more points eventually you are prompted to get this for a super low price of 99 cents. Totally worth it, and you get free coins along with it (ok, so maybe I didn’t earn ALL of my 1,000 coins!). Looking to collect more coins? You might get a chance to share this on your facebook app for free coins. By the time I got to level 20, I definitely needed my wife’s help (didn’t want to give up 60 coins as I was on the brink of losing my 1k coins!) Seriously though, I really appreciated the challenge because it made me think and I knew I was learning.The bible quotes/snippets after each puzzle allowed me to breath the Word and take comfort in Him. This is going to be the perfect app for me to have on my new IPad when I have downtime or simply want to have a quick challenge. I rate this 5/5 crosses! Well, I’ve got to go as level 21 is waiting: not sure how many there are to go, but I feel like I’m climbing the ladder to heaven.